at the Exxon-Mobil Refinery in Torrance, California. The product water from this plant is fed to the refinery’s ion exchange system for production of low pressure boiler feed water. 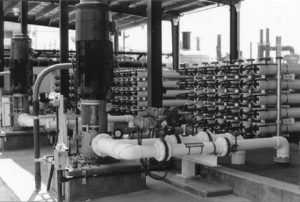 SPI’s scope of work included the procurement specifications for the microfiltration equipment and detailed design of the reverse osmosis equipment. SPI also prepared the plant operations and maintenance manual, assisted during facility startup, and provided training of plant operating personnel.